Gathered around the campfire circles this evening are modern story tellers and ancient circle dancers, Brazilian music, and spectacle arts. Gingarte Capoeira will present on both the history and the technique of the Brazilian martial art and Aloft Circus Arts will be on hand giving scarf juggling workshops. The Conservatory’s own Garfield Guides will be giving historic tours of the Garfield Park Conservatory, as well as offering information about Jens Jensen, the landscape architect responsible for both the Conservatory and the council ring. Bring a picnic, and join in the food and fun. This evening features the beautiful voice of the Poetic Storyteller, Oba William King, as well as the Brazilian beats of Chicago’s very own Copacabana. Urban fire masters Pyrotechniq will be tending the fires, as well as dancing amongst its flames in the final part of the evening. 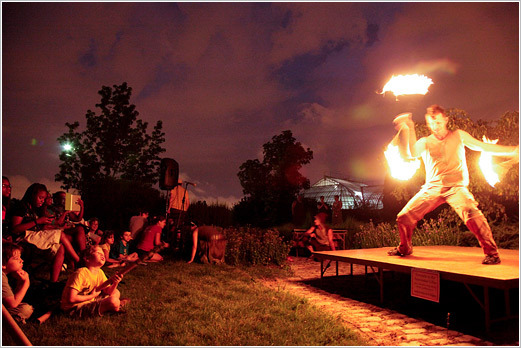 Check back for a detailed schedule of this final “Conservatory Campfire” event this summer. The Mobile Learning Adventure (MLA) is a traveling exhibit that provides an opportunity for parents and caregivers to learn about the importance of early childhood education while they engage in fun activities with their children. A part of PNC Grow Up Great - a $350 million, multi-year initiative that began in 2004 to help prepare children from birth to age 5 for success in school and life - the MLA includes interactive kiosks and the “When I Grow Up” station, where kids dress up as different professionals and have their picture superimposed on an appropriate background. In addition, parents can take home activity books and learning kits that demonstrate how to take everyday moments and turn them into learning opportunities.